Here will be a review of Planetary Herbals Thyroid Lift. This is a supplement which the manufacturer states is used by those who want to support and promote healthy thyroid function. The manufacturer also states this supplement will have other added benefits such as increased metabolism and energy. Please continue to read to determine if this is a product that is ideal for you and the current lifestyle you have. 1.72 Proprietary Blend which consists of: gamma-Vitamin E Complex, N-Acetyl-L-Tyrosine, Guggul Extract, Aswagandha Root Extract, Holy Basil Leaf Extract, Astragalus Root Extract, Antler Velvet, Fo-ti Root Extract, and Forskohlii Root Extract. Other ingredients included in this product are: dibasic calcium phosphate, stearic acid, silicified microcrystalline cellulose, modified cellulose gum, and silica. This product also contains soy, which means those with any soy allergens should not take this product. The manufacturer recommends a healthy adult individual to take 2 tablets on a daily basis. The person can decide if they want to take the tablets with or without a meal. This is not an item for children and for women who are pregnant, nursing, or anyone who currently has a medical condition which requires medication should first speak with their physician before taking this supplement. If unsure and without consultation of a physician, adverse reactions can occur. The suggested retail price for this item is $24.98 for the 60 tablet count and $48.50 for the 120 tablet count. It must be noted the manufacturer does not sell directly to consumers and some authorized retailers do have this at a lower price. Since this is not directly sold by the manufacturer, it is suggested that you shop around for the best price. The company itself stands behind a 100% customer satisfaction guarantee. If a person is not satisfied with the product, he or she can simply return the product to the store or online retailers they purchased it from. If there is an issue with either the store or online seller, the person can contact the manufacturer directly to resolve the issue. Many of the online retailers display reviews from consumers, many have concluded this product to live up to its claims. Planetary Herbals Thyroid Lift is a supplement that is not only backed with a customer satisfaction guarantee, it is also back by the positive reviews from consumers. While it can be a bit of a hassle to purchase from a third party/authorized seller, it seems that with a little bit of research you can get this product at a lower price than what is suggested. Overall, it seems this product does live up to its claims. If you are looking to support your thyroid and perhaps boost the overall energy production, this may be the right product for you. 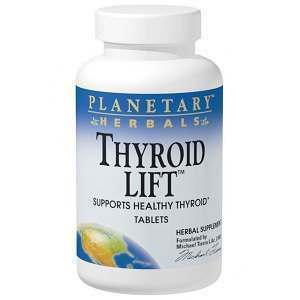 Lauren Shepherdson	reviewed Planetary Herbals Thyroid Lift	on August 6th	 and gave it a rating of 3.